Joseph of Leonissa, OFM Cap. ; was the third of eight children born at Leonessa (Italy) on January 8, 1556. At baptism he was given the name Eufranio. Impressed by the example of Matthew Silvestri, who had left the medical profession to embrace the Capuchin life and whose holiness was evident, Eufranio was inspired to become a Capuchin. After overcoming family opposition, he was admitted to the novitiate and received the habit and the name Joseph and made profession on January 8, 1573. 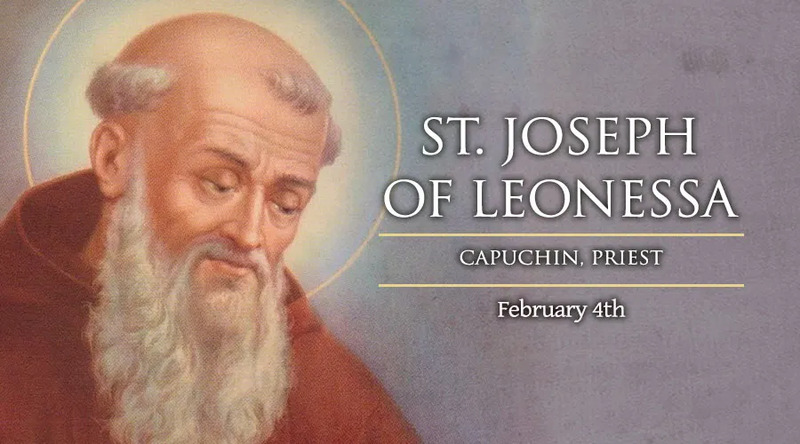 On May 21, 1581, the Capuchin general vicar issued patents for preaching, the ministry in which Joseph would be engaged for the remainder of his life. Relying solely on grace and with a mission crucifix always tucked in his cincture, Joseph negotiated the most obscure, mountainous regions of Umbria, Lazio and the Abruzzi in an intense and extensive mission of evangelization among those who were poor. Joseph enjoyed such great success in preaching because of his intimate union with God which was cultivated by incessant prayer. He would pray and meditate on the road, while holding his crucifix. Assigned to Constantinople he was appointed as chaplain to some 4,000 Christian slaves who worked in the penal colony of Qaasim-pacha. He immediately went to work bringing the gospel and charitable relief to those who were languishing in inhumane conditions. Many times he offered himself as a substitute in order to obtain the release of a slave who was near death. His offer was never accepted. When the plague broke out in the penal colonies, the Capuchins immediately took up the ministry of assisting those who were sick and dying. Two Capuchins, Peter and Dennis, died doing so. Although Joseph became ill, he and Brother Gregory alone survived to remain at the mission. After converting a Greek bishop who had renounced the faith, Joseph devised a plan which entailed approaching the sultan, Murad 111, to seek the recognition of the right of freedom of conscience for anyone who was converted or returned to the Christian faith. When Joseph attempted to enter the sultan's chambers, he was arrested and bound in chains. He was condemned to an immediate death by being hung on hooks. He was hung from the gallows with one hook through the tendons of his right hand and another through his right foot. Near death, on the evening of the third day, the guards cut him down. Joseph quickly left Turkey and arrived at Rome where he and the converted Greek bishop presented themselves to Pope Sixtus V. Following Joseph's return to Italy, in the autumn of 1589, he took up residence at the Carcerelle in Assisi. In the aftermath of the Council of Trent, Joseph spent much time and energy catechizing. He began a ministry of evangelization among shepherds who lacked even rudimentary knowledge of the faith, prayer and the commandments. He would walk through the streets ringing a bell, reminding parents to send their children to catechism class. When he became deathly ill, Joseph asked to be taken to Leonessa in order to pay his last respects to his relatives and friends. On Saturday evening, February 4, 1612, after beginning the divine office,which proved too difficult to continue, Joseph repeated his favorite prayer: "Sancta Maria, succurre miseris." Joseph was beatified by Clement XII in 1737 and canonized by Benedict XIV in 1746.